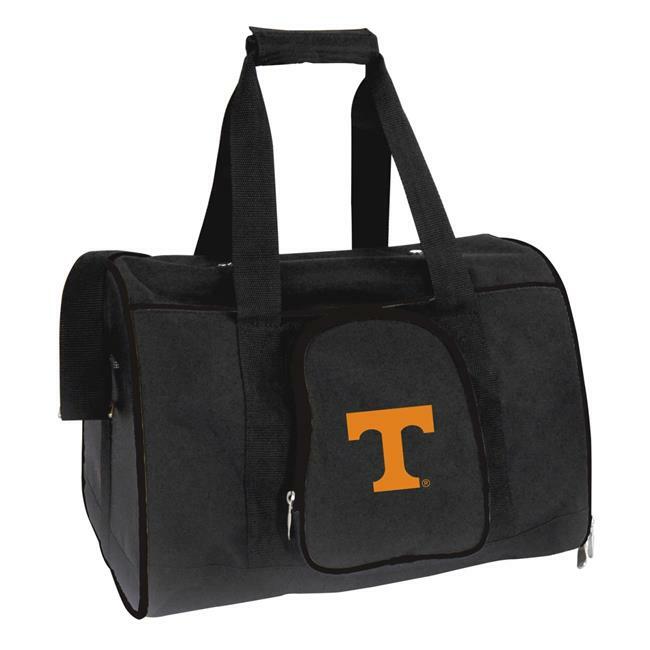 The NCAA Tennessee Pet Carrier Premium 16in bag in Black is a stylish yet convenient and safe way to travel with your pet. Made of lightweight polyester. Fits comfortably under most airline seats while affording your pet ample, non-compacted space. Accomodates pets up to 16 lbs. Its top and side zipper entry panels make for easy pet access. Plastic mesh panels on three sides provide excellent ventilation and pet visibility. Includes a safety tether to hook. Has a removable washable fleece floor panel for comfort and structural stability. Carrier is easy to lift and carry. With a sturdy padded top handle; adjustable/detachable shoulder strap and a side sleeve that enables the carrier to slide onto the handle of your roller suitcase. for easy transport within the airport. Also includes a side zipper pocket for small items.